This working paper reviews the current policy of removing failed asylum seekers in Australia and draws lessons from similar policy areas and reforms in the United Kingdom and Canada. This working paper reviews the current policy of removing failed asylum seekers in Australia and draws lessons from similar policy areas and reforms in the United Kingdom and Canada. The authors put forward five policy recommendations. First, forcible removal of failed asylum seekers should be used as a last resort. Second, timely processing and removal is critical and deadlines could be reintroduced. Third, immigration detention periods can be shortened. Fourth, Australia would benefit from stronger international cooperation, including readmission agreements with countries of origin. Lastly, and most importantly, policymakers must ensure that removal of failed asylum seekers adheres to the principle of non‑refoulement. With the number of displaced persons worldwide at record highs of 65.3 million at the end of 2015, the forced return of failed asylum seekers is becoming an increasingly important policy issue. The integrity of the international protection regime depends in part on the ability of states to return people whose asylum claims have been rejected to their country of origin. Yet the topic receives little discussion within academic and policy communities. Most countries that receive asylum applications aim to enforce negative decisions by deporting failed applicants. However, forced returns policy presents challenges. Enforcing the policy requires coercion and for that reason can cause resentment and attract condemnation. It is also expensive and requires concentrated resources. Given that the policy challenges the norms of liberal states, success in this area of policy is contentious and difficult to define. From 2010/11 to 2015/16 the number of failed asylum seekers removed from Australia almost doubled, from 877 to 1752. Despite this increase, Australia’s forced returns policy still faces significant challenges. This working paper examines case studies from the United Kingdom (UK) and Canada to provide a comparative perspective on forced returns policy and to gain insight into how Australia can tackle policy challenges. The UK and Canada are relevant because they offer examples of how western liberal democracies have reformed their approach to forced returns. The paper assesses the strengths and weaknesses of the UK and Canadian reforms and draws lessons that may be applicable to Australia’s forced returns policy. To provide context for the discussion of forced returns policy, it is important to briefly outline the process by which asylum seeker claims are determined in Australia. Figure 1 shows the process in its simplest form. For people who submit an application after arriving in Australia legally (onshore applicants), the Department of Immigration and Border Protection (DIBP) assesses their claims and make a decision. 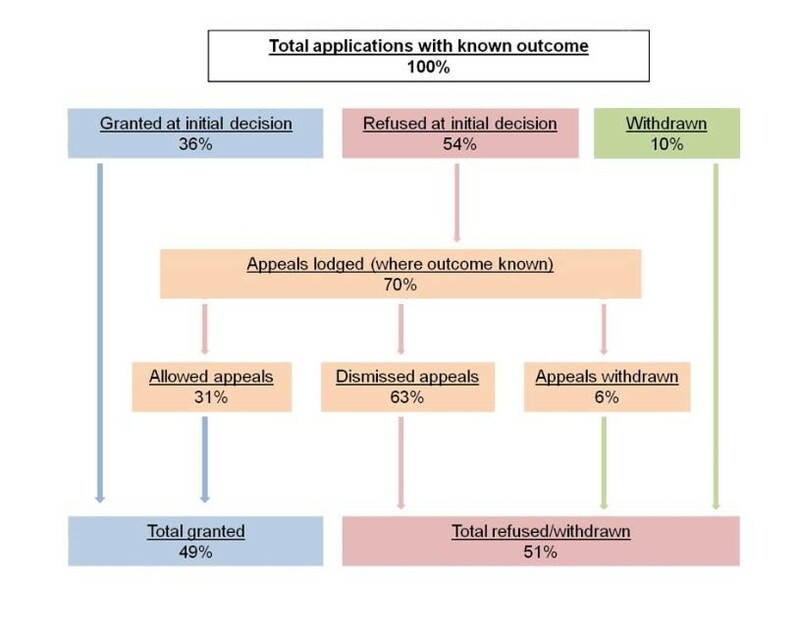 Unsuccessful applicants may, subject to exceptions, apply for a merits review of that decision in the Administrative Appeals Tribunal (the Tribunal). The Tribunal exercises a wide range of powers, and may affirm, vary, set aside, or remit decisions for reconsideration. Unsuccessful applicants can apply for judicial review of a Tribunal decision, usually in the Federal Circuit Court of Australia. Asylum seekers who arrive illegally by boat between 13 August 2012 and 1 January 2014 who lodged ‘fast-track’ applications face a streamlined initial decision process and a modified form of merits review. Some boat arrivals are separated into ‘excluded fast-track review’ applications based on, among other things, whether the Minister for Immigration and Border Protection (the Minister) is of the opinion that the claims are ‘manifestly unfounded’. Both onshore applicants and boat arrivals may request the Minister to exercise a personal discretion to allow a fresh protection visa application or to grant a protection visa. The Minister is under no obligation to consider these requests. 51.6 per cent of onshore applications were finally rejected, but the rate dropped to 37.7 per cent in 2013/14. By contrast, there were no final rejections of illegal maritime arrival (IMA) applications in 2008/09, but the number of final rejections of IMA applications rose. This indicates the majority of boat arrivals are either still being processed or determined to be refugees. Under the Migration Act 1958, the DIBP is required to detain and remove all unlawful non-citizens, including failed asylum seekers, as soon as reasonably practicable. In 2016 the DIBP estimated that 64 600 unlawful non-citizens were living in Australia, an increase from 62 000 in 2015. This number, however, comprised mostly tourists and students who overstayed their visas. The precise number of unlawful non-citizens in the community who are failed asylum seekers is not known. Between 2008 and 2014, there were more than 2000 final rejections of onshore asylum applications each year. Under a strict implementation of the Migration Act, in theory these finally rejected asylum seekers are to be removed from the country. However, in reality, the policy faces a number of challenging issues elaborated in the section below. Australia has both voluntary and involuntary returns policy. The DIBP operates an Assisted Voluntary Return program, administered by the International Organisation for Migration (IOM). Asylum seekers who agree to return voluntarily may be eligible for reintegration assistance, including payments and support designed to sustain return. Data released by the DIBP in August 2014 reveals that between September 2013 and July 2014, 1151 boat arrivals voluntarily returned to their country of origin. Failed asylum seekers who refuse to depart voluntarily are removed, where possible. Data released by the DIBP shows that Australia has increased the number of forced returns of asylum seekers over the past six years (see Table 2). The steady increase in the number of forced returns is in contrast to the changing flows of asylum applications to Australia, which fluctuate from year to year as shown in Table 1. These data demonstrate that since 2012 Australia is removing an increasing proportion of failed asylum seekers relative to the number of asylum applications it rejects each year. The forced return of failed asylum seekers is one of the most contentious areas of immigration policy in liberal states. Australia’s forced return of asylum seekers has been criticised by the United Nations (UN) Special Rapporteur on torture. In a report published in March 2015, the Rapporteur detailed allegations concerning 203 Sri Lankan asylum seekers and migrants and argued that their imminent deportation to Sri Lanka by the Australian Government was “in contravention of Australia’s non-refoulement obligations”. Some scholars argue that Australia’s complementary protection regime, which is designed to prevent deporting people into danger, is not acting as a sufficient safeguard. A major challenge for forced returns policy is the lengthy process for deciding protection claims. The timely departure of failed asylum seekers is a requisite part of asylum processing. Asylum seekers, however, often wait more than two years for a final decision after going through the Tribunal and the courts. Between December 2005 and February 2015, the DIBP was required to report quarterly to the Minister on the percentage of protection visa applications decided within 90 days. In 2014/15 the DIBP made initial decisions within 90 days only 8 per cent of the time, while in 2013/14 it was 7 per cent. The review process can also add significant delay. At 30 June 2016, there were 5434 cases pending in the Tribunal’s refugee division. For decisions the Tribunal made between 1 July and 31 December 2016, it took on average 406 days, or over 13.5 months, for an applicant to receive a Tribunal decision after lodging an application. Data on judicial review times are scant, but as an indication the DIBP has reported that in 2010/11 federal courts took an average of five months to resolve migration and refugee decisions. Ministerial intervention adds further time and uncertainty to the process. According to the new guidelines implemented in 2016, the DIBP decides most requests. The Rudd government distanced itself from the process, with the former Minister Chris Evans stating in 2008 that an “industry” had grown up around seeking ministerial intervention. In 2006/07, the DIBP received 3303 requests, of which the Minister considered 2741 and granted 847 visas. By 2011/12, 2024 requests were received, of which the Minister considered 1318 and granted 458 visas. But the process remains lengthy and results highly uncertain. 31 January 2017, there were 1351 people in Australian immigration detention facilities, 25 252 in the community on bridging visas, and 1241 in offshore detention centres. Australian law mandates that there is no time limit on detention and that unlawful non-citizens must remain in detention until they are either granted a bridging visa to stay in the community or removed from Australia. At 30 June 2016, the average period of time detainees had spent in immigration detention was over a year, at 441 days. At 31 December 2016, the average length of detention had increased to 484 days. Australia’s policy of mandatory immigration detention is costly. As one might expect, costs soared after increases in boat arrivals. The cost of running offshore processing centres in the three years from 2013 to 2016 is estimated at $9.6 billion. According to the Kaldor Centre for International Refugee Law, it costs around $400 000 per year to hold one person in offshore detention and $239 000 to detain them in Australia; less than $100 000 per year for a person to live in community detention and around $40 000 for an asylum seeker to live in the community on a bridging visa. Living in the community is a preferable option for an asylum seeker but it does mean that individuals and families build substantial ties to Australia. The threat of removal not only jeopardises those ties but also increases the chance that the asylum seeker will disappear into the community. Whether detained or living in the community, swift processing and removal should be considered the more ‘humane’ option but also the one that best serves government. Australia’s forced returns policy is also hampered by a lack of international cooperation, primarily in verifying the identity of returnees and issuing travel documents. Readmission agreements can be one way of alleviating friction between countries. Australia has concluded a small number of agreements that are “confidential at the request of the agreement partner country”. However, some countries such as Iran, which has been a significant source of asylum seekers in Australia, refuse to accept returnees. The Iranian Government has said that it would accept voluntary, but not forced, returns from Australia. Even when readmission agreements do exist, there can still be problems. For example, Australia signed a Memorandum of Understanding with Afghanistan and the United Nations High Commissioner for Refugees (UNHCR) on 17 January 2011. It expresses Afghanistan’s agreement to verify nationality and issue travel documents within six weeks of a request, in return for financial assistance. But implementation of the agreement has been problematic, partly because of lack of capacity on the Afghan side. The number of returns to Afghanistan almost halved between 2014/15 and 2015/16. Indeed, where it is difficult to verify nationality, there is reason to question why Australia should expect a receiving country to admit someone without adequate proof of identity. Against the background of these challenges, it is worth considering how other liberal democracies have managed the forced return of failed asylum seekers. Asylum reforms in the UK and Canada provide instructive comparisons with Australia. Like Australia, both countries have seen significant increases in asylum seeker applications in the last two decades. Governments in both countries responded with procedural reforms to the return of failed asylum seekers. The reforms have had varying success. The following section reviews what did and did not work in the UK and Canada in order to draw out insights for policy reform in Australia. Asylum applications to the UK rose sharply from 46 000 in 1998 and peaked at 84 000 in 2002. Applications then dropped to 33 000 in 2004. However, from 2004 to at least 2010 the UK, like Australia, experienced a ‘legacy caseload’, although in much larger numbers at some 400 000 to 450 000 claims. In 2004/05 the UK announced a concerted effort to enforce asylum decisions and remove failed asylum seekers. In September 2004 the government of then Prime Minister Tony Blair set the Home Office a target. By the end of 2005 the number of failed asylum seekers removed from the UK each month was to exceed the number of asylum applications predicted to be unsuccessful. The Home Office, however, never achieved that target. In the UK, an asylum seeker whose claim has been rejected by the Home Office can appeal to an independent judicial body, the Asylum and Immigration Tribunal, and then the High Court of England and Wales. Once these processes are exhausted, individuals are due to be removed. Using data from 2012 to 2014, Figure 2 below shows the flow of applicants through the UK asylum system. When the Blair government came to office in 1997, the asylum system it inherited was inefficient and complex. Numbers of asylum applications had been rising and applicants waited years for a decision. In 1998 the new government commissioned a White Paper on immigration and introduced major legislation in 1999 aimed at deterring perceived abuse of the system. It introduced measures to reduce asylum seekers’ access to welfare, dispersed migrants out of London, increased the power of immigration officers to arrest and detain migrants, quadrupled the UK’s detention capacity to 4000 places, and introduced targets for the number of people to be removed annually. In 1997 the number of removals from the UK was 7160. In 2006, before Blair left office, that number had more than doubled to 16 330. There were four elements to the Blair government’s reform of the UK’s system of processing asylum applications. There has been further reform in the UK, especially around creating a ‘hostile environment’ for failed asylum seekers, but we limit our comparison to the key measures during the Blair government for this paper. The first reform was an unprecedented reduction in the time taken to process claims. The ‘Detained Fast Track’ was a significant innovation and operated between 2000 and 2005 in embryonic form, and then formally until 2015. It brought average processing times down from 13 months in 2002, to 80 per cent of claims being decided within two months in 2005. In 2000 the Home Office trialled a new system of detaining some asylum applicants in the Oakington detention centre while it processed their claims. Previously all asylum applications were processed in the same way, with no fast track, and only a small portion of applicants were detained. In 2005 this new system became formalised and expanded from applying only to applicants from certain countries deemed to be ‘safe’ to return. The Home Office could then fast track any asylum application it considered could be decided quickly, such as “manifestly unfounded” claims. The Blair government extended the initiative in the same year by announcing a five-year ‘New Asylum Model’ aimed at faster, more tightly integrated processing of asylum claims. The New Asylum Model began operation in 2006 and emphasised rapid integration or removal from the UK. The Detained Fast Track program implemented a strict timetable for processing asylum applications. On day one the applicant was detained. On day two they were interviewed by immigration officers and on day three served with a decision. Any appeal was to commence within one week, meaning that the asylum seeker could potentially be removed within ten days of arrival. During the appeal period the asylum seeker completed a ‘One Stop Notice’ form. This was a final chance to consolidate all reasons — protection-related, compassionate, and otherwise — why a person should be allowed to remain in the UK. If the applicant raised a new reason later in the process, further appeal rights narrowed considerably. The success rate for asylum seekers was very low: Yarl’s Wood detention centre Fast Track recorded a 99 per cent refusal rate in 2005/06. Outside the Fast Track system, success rates for asylum seekers were between 14 per cent and 28 per cent during the same period. Success rates in the fast track remained at under 2 per cent until 2010. The UK’s Detained Fast Track program is now defunct, after a legal challenge in which the Court of Appeal upheld a decision to suspend elements of the system. The Court found that the drastically abridged time in which applicants could prepare for an appeal was “systematically unfair and unjust”. The Fast Track did not “adequately take account of the complexity and difficulty of many asylum appeals, the gravity of the issues that are raised by them and the measure of the task that faces legal representatives in taking instructions from their clients who are in detention”. £188 million to £300 million. During the same period, the number of UK immigration officers and caseworkers more than doubled, from 627 to 1385 personnel. Parallel to these rapid trends was the rise in removals of failed asylum seekers, which rose by 52 per cent between 2000/01 and 2003/04. The cost per removal also rose, from £9500 to £10 500. From 2006, the New Asylum Model introduced a Single Case Owner system, with each asylum claim allocated to a single caseworker. That caseworker was responsible for the asylum claim from application and review through to arranging voluntary or enforced departure. The Single Case Owner and Detained Fast Track systems were expensive. By 2007/08, the annual cost of administering the New Asylum Model itself was an estimated £176 million. This is clearly a drop from £300 million in 2003/04; however, asylum applications had also fallen from around 49 000 in 2003 to 23 000 in 2007. In 2007/08 alone the UK spent £600 million on resolving the legacy of asylum claims from prior to 2005. The third element of reform was to increase immigration detention capacity and link forced return to detention. The principle behind the policy was that increasing places in the detention estate would help the Home Office achieve the 2004 removal target. Prior to 2005 when the Detained Fast Track program expanded, the processing of asylum claims and the immigration detention network were largely run as two separate systems. Detention facilitated the process of forced return by preventing the asylum seeker from absconding. During 2007/08, only 7 per cent to 9 per cent of non-detained asylum seekers were removed after rejection; removal of rejected Fast Track applicants stood at 97 per cent. To facilitate forced return, since 2005 the UK detention estate has grown to one of the largest in Europe. Between 2001 and 2005 the number of beds in the UK’s detention estate rose from around 1750 to 2750. It maintained over 4200 beds in 2015. Table 3 shows that since 2011 there have been between 2500 and 3500 people in detention in the UK at any given time. Of the 33 189 people who left detention in 2015, 10 540 or over 30 per cent were removed from the UK directly. This figure accounts for all non-citizens including failed asylum seekers. The Home Office notes that the drop in detention numbers from 2014 to 2015 can be “partially attributed” to the suspension of the Detained Fast Track. The fourth element of reform was a concerted effort to negotiate readmission of failed asylum seekers to their countries of origin. The Blair government negotiated a range of readmission agreements with countries including Pakistan, Afghanistan, Sri Lanka, Turkey, China, Albania, Bulgaria, Romania, Vietnam and Somaliland. Before he left office in June 2007, Blair appointed Lord Triesman of the Foreign and Commonwealth Office as the UK’s “Special Envoy for Returns”. Lord Triesman’s role was to help the UK achieve its 2004 removal target, by working with foreign governments in order to “open up new routes to countries from which we have experienced large numbers of unfounded asylum claims and immigration offenders, to sustain returns and reinforce public confidence in our immigration system”. By 2014 the UK had 16 bilateral readmission agreements with asylum countries of origin. Canada’s reforms to its asylum system between 2008 and 2012 provide further policy options for tackling a backlog of protection claims. Canada is regarded as maintaining a generous refugee policy that in general meets its international obligations: it accepted 23 285 refugees in 2014. The number of asylum applications to Canada rose from 19 660 in 2005, peaked at 36 759 in 2008 and fell back to 20 426 in 2012. Figure 3 shows the fluctuation in asylum applications over this period. After the peak of applications in 2008, Canada experienced similar challenges to the UK and Australia. The processing of asylum claims became less efficient with unsuccessful applicants waiting between three and half and four years for a final decision to remove them. Prime Minister Stephen Harper’s Conservative government assumed office in 2006. Amid rising asylum claims the government undertook legislative and policy reform from 2010 to 2012. Like the Blair government’s objectives in the UK, the Canadian reforms aimed to “deliver faster decisions, deter abuse and quickly remove unsuccessful asylum claimants”. The Harper government imposed time limits and targets on asylum claim processing and forced returns, reformed the appeal system, and increased enforcement powers while keeping average detention times short, relative to Australia and the UK. Asylum applications almost halved from 20 223 in 2012 to 10 356 in 2013. Canadian processing of asylum claims differs in certain important respects from the UK and Australia. A person can make a refugee claim to the Canada Border Services Agency (CBSA) at either a port of entry on arrival, or at an inland immigration office. What is distinctive about the system is that if the CBSA deems the person eligible to make an asylum claim, it refers them to an independent tribunal called the Immigration and Refugee Board (the Board) for the initial determination. Most rejected applicants can seek judicial review in the Federal Court. It is then the CBSA that ultimately must consider whether unsuccessful asylum seekers may apply for a Pre-removal Risk Assessment (Risk Assessment) to determine any outstanding non-refoulement obligations. Similar to ministerial intervention in Australia, the unsuccessful applicant may also apply for leave to remain on Humanitarian and Compassionate grounds based on compelling personal circumstances. To achieve the objective of timely review and forced returns, Canada implemented four major reforms. The first reform was to legislate timelines and set administrative targets for the steps in the system of review. Prior to the 2010–12 reforms it took an asylum seeker an average of 24 months to receive a negative decision from the Board. To reduce review times, the Harper government began by separating all asylum seekers by their country of origin. Those from a list of (initially 27) ‘safe’ countries were subject to expedited hearings. The Board’s target was to hold 90 per cent of hearings within 30 days for safe country applicants who applied from within Canada, within 45 days for safe country applicants who applied at a port of entry, and within 60 days for non-safe country applicants. Similarly, the newly established Refugee Appeals Division of the Board (Appeals Division) was to make 80 per cent of appeal decisions (except where it held an oral hearing) within 90 days. The second reform was to set timelines on the forced return of rejected applicants. Prior to the 2010–12 reform period, it took on average 550 days, or one and a half years, to remove a failed asylum seeker from Canada after the Board had made a final, negative decision. The CBSA’s target in 2014/15 was to complete 80 per cent of forced returns of asylum seekers within 12 months of rejection. The CBSA should have been assisted in meeting this target by the falling number of forced returns it was required to complete. By 2012 the CBSA removed 13 869 failed asylum seekers that year, but this number fell to 10 743 in 2013 and 7852 in 2014. The fall in forced returns might have been related to the fall in the number of ‘legacy’ asylum claims shown in Figure 3. Although neither the Board nor the CBSA met their targets across any category, they did achieve substantial reductions in review and removal timeframes. Where the CBSA’s target was 80 per cent of forced returns within 12 months, it completed 51 per cent within this time. For asylum seekers who were rejected in 2013, the average time from the Board’s decision to forced return was 204 days, 300 days shorter than in 2009. The CBSA cited the major obstacles to removal as, among others, lack of cooperation from countries of origin over travel documents, difficulty in locating the asylum seeker, and ongoing legal proceedings. The Board did not meet its targets for heavily truncated review times although it did note substantial improvements in 2014. It cited the requirement to afford a fair hearing, delays in security risk screening, and internal operational delays as reasons for not meeting the targets. However, in 2013 the Appeals Division made 96 per cent of its decisions within the 90-day timeframe. The third reform was an overhaul of the asylum appeals process. The most significant amendment of the Harper government years was to establish the Appeals Division of the Board in 2010. Establishing the Appeals Division allowed merits review of initial determinations. It offered a safeguard which should have avoided the removal of genuine refugees. However, asylum seekers who are considered safe country nationals had no recourse to the Appeals Division until July 2015, when a Federal Court decision opened new appeal rights for them. Asylum seekers with “manifestly unfounded” claims still have no recourse to the Appeals Division. More controversially, the Harper government restricted access to other safeguards including the Risk Assessment, Humanitarian and Compassionate consideration, and judicial review. The Risk Assessment gives failed asylum seekers an opportunity to explain the danger they would face if they were to be removed from Canada. It assesses the risk of torture and other non-refoulement obligations. The 2012 reforms barred asylum seekers from applying for a Risk Assessment for 12 months after their claim had been rejected. Designated safe country nationals are now barred for 36 months after rejection. Humanitarian and Compassionate consideration is also heavily restricted under the reforms. Applicants are barred from submitting Humanitarian and Compassionate claims for 12 months after their asylum claim has been rejected, and can no longer do so concurrently with an asylum application. There is no automatic bar to forced return when someone seeks judicial review in the Federal Court, so asylum seekers with ongoing litigation can be removed. Each of these measures has removed barriers to forced return. In the interests of expediency there is now a risk that not all people removed from Canada have had their protection claims properly assessed. The Canadian Government later backtracked on the 12-month bar on Risk Assessments and granted exemptions to 12 countries. However, Canada’s continuing removals to Burundi in Eastern Africa throughout 2015 served as a focal point for increasing media attention. The UNHCR reported that between April and July 2015 alone over 167 000 people fled Burundi due to an “escalating pattern of politically motivated violence”. Canada added Burundi to the list of countries exempt from the Risk Assessment bar in August 2015. Although asylum seekers had access to the Risk Assessment it was an ineffective safeguard because 98.6 per cent of cases were rejected, even as reports continued of returnees being “shot at and beaten” on return to Burundi. In September the Canadian Association for Refugee Lawyers called for a moratorium on all removals to Burundi. In recognition of the danger, the newly elected Liberal government of Justin Trudeau announced a moratorium on 2 December 2015. Canada’s fourth reform was to increase immigration enforcement powers while keeping average times in detention reasonably short. In Canadian law, immigration officers have the power to issue an arrest warrant if there is a possibility that a non-citizen will not appear for a hearing or proceeding, poses a danger to the public, or cannot prove their identity to the satisfaction of an immigration officer. The 2012 reforms also allowed the Minister of Public Safety to designate the entrance of a non-citizen as an “irregular arrival”, effectively imposing mandatory detention. At the same time, however, Canada has kept average times in detention shorter than in Australia and the UK, partly because of compulsory detention reviews. The Board must hold a review to determine whether there is reason to continue detention 48 hours after a person is detained, then again at 7 days, and then every 30 days thereafter. The Board has the power to order a person’s release if there is insufficient reason for continuing detention. According to the Global Detention Project, in 2010/11, the average length of detention was just 25 days. For people released from detention after a review, the average time in detention in 2015 was 60 days. Notwithstanding short times on average, there are still concerns that Canada practices what amounts to indefinite detention, with one person having served over eight years of continuing detention in 2015. There are five specific lessons Australia can learn from the reforms undertaken by the UK and Canada. First, forced return of failed asylum seekers begins with strong and justifiable grounds for rejecting asylum seekers and removing failed applicants. Australia separates illegal boat arrivals, which has been the subject of international criticism. Under international law, the situation of a person’s country of origin and the nature of his or her forced migration should be the determining factor for refugee status rather than the legality of their mode of arrival. Distinguishing asylum seekers by their mode of arrival does not serve the purpose of Australia’s humanitarian migration program. Canada employs the concept of safe country of origin to separate asylum seekers into different streams. In the UK, during the Fast Track years, the government went further and separated claims that were “manifestly unfounded”, irrespective of an applicant’s country of origin. Australia can strengthen the country of origin information not just by sharing the information with the UN or other refugee-processing countries such as the UK or Canada, but also by having its own expertise on the ground and applying strictly humanitarian grounds for accepting or rejecting asylum seekers. Second, Australia can consider setting deadlines and timeframe targets for each of its current refugee determination processes. The fast track system can be strengthened, provided that there are safeguards to ensure fairness to asylum applicants. Timely review at every step of the primary decisions, appeals, judicial reviews and ministerial interventions are key. This would help process genuine refugees in a timely manner as well as remove failed applicants with minimal delay. Fast tracking could be expanded from boat arrivals to onshore applicants. This is a fortiori the case where the rationale for fast tracking is to target claims less likely to succeed. However, drawing on the UK’s experience, policymakers must ensure that fast tracking does not put applicants at an administrative disadvantage. This could be achieved by allowing consistently enforced timeframes for each step. What has been effective in the UK and Canada is setting deadlines on each step of processing protection claims. The shortest deadlines for the UK Fast Track was just one week. Its own Court of Appeal found it too short in 2015. After setting timeframes, the Canadian Immigration and Refugee Board managed significant improvements in moving rejected claimants to forced return. Australia may consider reintroducing the DIBP’s deadline per initial refugee decision. Third, balancing forced return with minimising unnecessary detention could inform Australian policy. In 2015, there were 32 446 people entering and 33 189 leaving immigration detention in the UK. The UK ensures the flow in detention centres is constant. At January 2016, there were 418 detainees in immigration detention centres. In the same year, Canada detained 6768 foreign nationals and, at any one time, between 400 and 500 were in detention centres. In Australia, however, in December 2015 alone, there were 1792 people in onshore facilities and 1459 in offshore detention centres. The average length of stay in a detention centre in December 2015 was 445 days in Australia, compared to 24.5 days in Canada. In the UK, 62 per cent stayed in detention for less than 29 days in the same year. Australia does not have a good flow in its immigration detention centres. Furthermore, according to the International Detention Coalition based in Geneva, the cost of immigration detention in Australia is more than three times that of Canada, with Australia paying around US$459 per person per day to Canada’s US$134. The UK estimate was around US$180 per day in 2010. The UK and Canadian experiences demonstrate that forced return is highly linked to detention capacity and flow. The UK managed to remove a high proportion of its failed asylum seekers who were already in detention. But it did so at the cost of implementing policies that were found to be systematically unfair and unjust. The insight Australia can gain from Canada is that the use of independent detention reviews, with the power to order release, is an important check on unwarranted long-term detention. Combining detention reviews with forced return could help to reduce Australia’s large detention estate. Detention reviews in Australia should be broadened to include eligibility for release or removal. Fourth, negotiating new readmission agreements would have an effect on the prospects for forced return. On the one hand, agreements can demarcate the roles and responsibilities of the parties with respect to challenges such as verifying nationality and issuing travel documents. On the other hand, countries of origin may refuse to come to the table or simply lack the capacity to ensure sustained return. In these circumstances there is no guarantee that a ‘protection clause’ will be respected. Effective implementation of readmission agreements with countries of origin will be as important as negotiating new agreements. DIBP can consider appointing a Special Envoy on Returns as a high-level negotiator of new readmission agreements. However, as the experience of Afghanistan shows, direct agency-to-agency cooperation between countries’ immigration and security officials would be vital to implement new agreements successfully. Australia can consider strengthening efforts to build capacity in countries of origin so that asylum seekers have a greater chance of reintegration and rehabilitation once they return. This will most likely be achieved by increased bilateral cooperation and technical assistance. Fifth, the implementation of forced returns should take account of Australia’s international obligations not to return failed asylum seekers to unsafe countries. State parties to the 1951 Refugee Convention must ensure the non-refoulement principle, not to remove people to situations where they face danger, torture and persecution. As shown above, the UN Special Rapporteur’s report on violence in Sri Lanka provides an important case study in this regard. Australia returns failed asylum seekers to Sri Lanka, despite credible evidence of targeted attacks and violence against civilians and Tamils in particular. This was also the case with Canada’s returns to Burundi, which the Trudeau government suspended in 2015. There are strong grounds to conclude that Australia could strengthen its system of complementary protection to mitigate the risks associated with forced return. Adopting robust safeguards regarding Australia’s non-refoulement obligations will promote the integrity of the Australian asylum system in line with the international protection regime. For this reason, the current complementary protection criteria could be reviewed for further risk assessment. (5) making sure that Australia respects the non-refoulement principle while involuntarily returning people who once sought asylum here but failed the country’s asylum regime. The authors would like to thank the anonymous reviewers at the Department of Immigration and Border Protection for their valuable comments. We would also like to thank Anthony Bubalo and Lydia Papandrea at the Lowy Institute for their constant editorial support. Special thanks to Glen Swan and Rodger Shanahan who gave us the initial idea to write about the topic. This working paper series is part of the Lowy Institute’s Migration and Border Policy Project, which aims to produce independent research and analysis on the challenges and opportunities raised by the movement of people and goods across Australia’s borders. The Project is supported by the Australian Government’s Department of Immigration and Border Protection. The views expressed in this working paper are entirely the authors’ own and not those of the Lowy Institute for International Policy or the Department of Immigration and Border Protection. United Nations Office of the High Commissioner, “With 1 Human in Every 113 Affected, Forced Displacement Hits Record High”, 20 June 2016, http://www.unhcr.org/en-au/news/press/2016/6/5763ace54/1-human-113-affected-forced-displacement-hits-record-high.html. This paper uses the terms ‘forced return’ and ‘removal’ interchangeably when referring to the involuntary departure of a non-citizen from a host country to his or her country of origin or a third country that is said to be safe. ‘Deportation’, on the other hand, refers to the ‘forced return’ or ‘removal’ of a non-citizen who has committed a crime under the laws of a host country. ‘Failed’ asylum seekers imply the legitimacy of a country’s asylum regime whereas ‘rejected’ asylum seekers indicate the regime’s subjectivity or arbitrariness. Assuming Australia’s asylum regime is legitimate, which is a separate topic, the authors use ‘failed’ asylum seekers in this paper. Figures from the Department of Immigration and Border Protection, at authors’ request. Departure figures were extracted from DIBP systems on 15 August 2016. On 1 July 2015 the Migration Review Tribunal (MRT) and the Refugee Review Tribunal (RRT) became the Migration and Refugee Division (MRD) within the Administrative Appeals Tribunal. Migration Act 1958 (Cth), ss 189, 198. Department of Immigration and Border Protection, Annual Report 2015–16 (2016), 50, https://www.border.gov.au/about/reports-publications/reports/annual. Department of Immigration and Border Protection, “Voluntary Returns between September 2013 and 16 July 2014”, Decision Record, FOI Request FA14/07/00197, August 2014, https://www.border.gov.au/about/access-accountability/freedom-of-information-foi/log/2014. Department of Immigration and Border Protection, Onshore Humanitarian Programme 2015–2016, https://www.border.gov.au/ReportsandPublications/Documents/statistics/ohp-april-16.pdf; Department of Immigration and Border Protection, Asylum Statistics—Australia: Quarterly Tables—June quarter 2014 (2014), https://www.border.gov.au/ReportsandPublications/Documents/statistics/asylum-statistics-aus-jun-qtr-2014.pdf; Department of Immigration and Border Protection, Asylum Trends — Australia: 2012–13 (2013), https://www.border.gov.au/about/reports-publications/research-statistics/statistics/live-in-australia/humanitarian-programme; Migration Review Tribunal and Refugee Review Tribunal Annual Reports, 2010–11 to 2014–15, http://www.aat.gov.au/migration-and-refugee-division/mrd-resources/mrt-rrt-annual-reports. Table 2 shows total monitored departures of non-citizens following a (finally determined) refusal of a humanitarian visa application by citizenship (2010/11 to 2015/16). The figures take into account onshore compliance departures and other monitored departures, including illegal maritime arrivals (IMAs), IMA crew, IMA Bridging E visa holders, illegal foreign fishers, and other unauthorised arrivals. The figures exclude departures after disengagement. Protection visa refusal data (as at 1 July 2016) used for data matching was provided by the DIBP’s Humanitarian Programme Reporting and Analysis Section. Departures figures were extracted from DIBP systems on 15 August 2016. Bridget Anderson, Matthew Gibney and Emanuela Paoletti, “Citizenship, Deportation and the Boundaries of Belonging”, Citizenship Studies 15 (2011), 547–563; Matthew Gibney, “Is Deportation a Form of Forced Migration?”, Refugee Survey Quarterly 32, No 2 (2013), 121; Matthew Gibney and Randall Hansen, “Deportation and the Liberal State: The Forcible Return of Asylum Seekers and Unlawful Migrants in Canada, Germany and the United Kingdom”, New Issues in Refugee Research, UNHCR Working Paper No 77 (Geneva: UNHCR, 2003). UN Human Rights Council, Report of the Special Rapporteur on Torture, and Other Cruel, Inhumane or Degrading Treatment or Punishment, A/HRC/28/68/Add.1, 5 March 2015, 8, http://www.ohchr.org/EN/Issues/Torture/SRTorture/Pages/SRTortureIndex.aspx. Jane McAdam, “From Humanitarian Discretion to Complementary Protection”, Australian International Law Journal 18 (2011), 64–65; Jane McAdam and Fiona Chong, “Complementary Protection in Australia Two Years On: A Developing Human Rights Jurisprudence”, Federal Law Review 42, No 3 (2014), 477. Migration Act 1958 (Cth), s 91Y. (Section 91Y was repealed by the Migration and Maritime Powers Amendment (Resolving the Asylum Legacy Caseload) Act 2014 (Cth)). Department of Immigration and Border Protection, Annual Report 2014–15 (2015), 126, https://www.border.gov.au/about/reports-publications/reports/annual. Administrative Appeals Tribunal, Refugee Caseload Summary by Country of Reference (2016), 5, http://www.aat.gov.au/migration-and-refugee-division/resources/statistics, accessed 16 February 2017. Administrative Appeals Tribunal, “How Long Will the Process Take?”, 2016, 1, http://www.aat.gov.au/migration-and-refugee-division/steps-in-a-review/how-long-will-the-process-take, accessed 16 February 2017. Department of Immigration and Border Protection, “Litigation Involving Migration and Citizenship Decisions”, updated 2015, https://www.border.gov.au/about/corporate/information/fact-sheets/09litigation. Chris Evans, “Ministerial Intervention Powers Under Review”, Media Release, 9 July 2008. Department of Immigration and Citizenship, Annual Report 2008–09 (2009), 97, https://www.border.gov.au/about/reports-publications/reports/annual. Department of Immigration and Border Protection, Ministerial Intervention: Statistics — Australia 2012–13 July to December (2013), 1, https://www.border.gov.au/about/reports-publications/research-statistics/statistics/live-in-australia/humanitarian-programme/ministerial-intervention. Mary Crock and Laurie Berg, Immigration, Refugees, and Forced Migration: Law, Policy and Practice in Australia (Sydney: The Federation Press, 2011), 356. Department of Immigration and Border Protection, “Immigration Detention and Community Statistics Summary”, 31 January 2017, https://www.border.gov.au/ReportsandPublications/Documents/statistics/immigration-detention-statistics-31-jan-2017.pdf. Ibid, 30 June 2016, https://www.border.gov.au/ReportsandPublications/Documents/statistics/immigration-detention-statistics-30-june-2016.pdf. Ibid, 31 December 2016, https://www.border.gov.au/ReportsandPublications/Documents/statistics/immigration-detention-statistics-31-dec-2016.pdf. Kaldor Centre, “The Cost of Australia’s Asylum Policy”, 24 June 2016, 1, http://www.kaldorcentre.unsw.edu.au/publication/cost-australias-asylum-policy. Catherine Phuong, “The Removal of Failed Asylum Seekers”, Legal Studies 25, Issue 1 (2005), 118. Intergovernmental Consultations on Migration, Asylum and Refugees, Asylum Procedures: Report on Policies and Practices in IGC Participating States — 2015 (Geneva: IGC, 2015), 53. Intergovernmental Consultations on Migration, Asylum and Refugees, “Return to Selected Countries Matrix”, May 2016. Department of Foreign Affairs and Trade, “Comprehensive Long-term Partnership Between Australia and the Islamic Republic of Afghanistan”, 20 May 2012, http://dfat.gov.au/geo/afghanistan/pages/comprehensive-long-term-partnership-between-australia-and-the-islamic-republic-of-afghanistan.aspx. Departures figures were extracted from DIBP systems on 15 August 2016. Protection visa refusal data (as at 1 July 2016) used for data matching was provided by the DIBP’s Humanitarian Programme Reporting and Analysis Section. Home Office, “National Statistics: Asylum”, 27 August 2015, https://www.gov.uk/government/publications/immigration-statistics-april-to-june-2015/asylum. UK National Audit Office, “Returning Failed Asylum Applicants”, 14 July 2005, 30, https://www.nao.org.uk/report/returning-failed-asylum-applicants/. UK National Audit Office, “Management of Asylum Applications by the UK Border Agency”, 23 January 2009, 4, https://www.nao.org.uk/report/management-of-asylum-applications-by-the-uk-border-agency/. Home Office, “Asylum Statistics: United Kingdom 2007”, Home Office Statistical Bulletin, 21 August 2008, 4, 26. Home Office, “The New Asylum Model: Swifter Decisions — Faster Removals”, Press Release, 18 January 2006, http://webarchive.nationalarchives.gov.uk/20070222120000/http://press.homeoffice.gov.uk/press-releases/new-asylum-model-swifter-decisio.html. Home Office, “The New Asylum Model”, Press Release, 18 January 2006. Immigration Law Practitioners’ Association, The Detained Fast Track Process: A Best Practice Guide, xi. Bail for Immigration Detainees and the University of Law, Deportation Appeals: A Basic Overview, October 2016, 4, http://www.biduk.org/information-detainees/bid%E2%80%99s-deportation-advice-project, accessed 16 February 2017. Immigration Law Practitioners’ Association, The Detained Fast Track Process: A Best Practice Guide, x. The Lord Chancellor v Detention Action  EWCA Civ 840 at . UK National Audit Office, “Returning Failed Asylum Applicants”, 29. UK National Audit Office, “Returning Failed Asylum Applicants”, 29. Not adjusted for inflation. UK National Audit Office, “Management of Asylum Applications by the UK Border Agency”, 4. The Migration Observatory, “Migration to the UK: Asylum”, 20 July 2016, http://www.migrationobservatory.ox.ac.uk/resources/briefings/migration-to-the-uk-asylum/. UK National Audit Office, “Management of Asylum Applications by the UK Border Agency”, 9. UK National Audit Office, “Returning Failed Asylum Applicants”, 30. UK National Audit Office, “Management of Asylum Applications by the UK Border Agency”, 23. See also Refugee Council, “Detention in the Asylum System”, March 2015, https://www.refugeecouncil.org.uk/assets/0003/3990/Detention_in_the_Asylum_System_March_2015.pdf. Global Detention Project, “United Kingdom Immigration Detention Report”, October 2016, 25, https://www.globaldetentionproject.org/category/publications/country-detention-reports. UK Home Office, “National Statistics: Detention”, updated 3 March 2016, https://www.gov.uk/government/publications/immigration-statistics-october-to-december-2015/detention. Home Office and Foreign and Commonwealth Office, “Managing Global Migration: A Strategy to Build Stronger International Alliances to Manage Migration”, June 2007, 14, http://webarchive.nationalarchives.gov.uk/20100406101254/http://www.bia.homeoffice.gov.uk/sitecontent/documents/managingourborders/internationalstrategy/strategy-2007.pdf?view=Binary. Home Office, “Record High on Removals of Failed Asylum Seekers”, 27 February 2007, http://webarchive.nationalarchives.gov.uk/20110113104715/http://press.homeoffice.gov.uk/press-releases/asylum-removals-figures. Home Office, “Good Practices in the Return and Reintegration of Irregular Migrants: Member States’ Entry Ban Policy and Use of Readmission Agreements between Member States and Third Countries”, August 2014. “Canada’s Refugees: Where they Come from by the Numbers”, CBC News, 4 October 2015, http://www.cbc.ca/news/canada/canada-refugees-1.3239460. Public Safety Canada, “Refugee Reform”, updated December 2015, https://www.publicsafety.gc.ca/cnt/brdr-strtgs/rfg-rfrm-eng.aspx. Nicholas Keung, “Canada’s Refugee Acceptance Rate Up Despite Asylum Restrictions”, The Star, 1 March 2015, https://www.thestar.com/news/immigration/2015/03/01/canadas-refugee-acceptance-rate-up-despite-asylum-restrictions.html. Immigration, Refugees and Citizenship Canada, “Backgrounder — Summary of Changes to Canada’s Asylum System”, http://www.cic.gc.ca/english/department/media/backgrounders/2012/2012-11-30c.asp. Immigration, Refugees and Citizenship Canada, “Evaluation of the In-Canada Asylum System Reforms”, 8. Canadian Association of Refugee Lawyers, “Reform Proposals for Canada’s Inland Refugee Determination System and Other Aspects of the Immigration System”, July 2016, 10–11, http://www.carl-acaadr.ca/articles/137. Immigration, Refugees and Citizenship Canada, “Evaluation of the In-Canada Asylum System Reforms”, 16. Amanda Connolly and BJ Siekerski, “CBSA Missed Failed Refugee Claimants Removal Target by 29 per cent in 2014–15: Performance Report”, iPolitics, 2 February 2016, http://ipolitics.ca/2016/02/02/cbsa-missed-failed-refugee-claimants-removal-target-by-29-per-cent-in-2014-15-performance-report/. Immigration, Refugees and Citizenship Canada, “Evaluation of the In-Canada Asylum System Reforms”,15–16. Connolly and Siekerski, “CBSA Missed Failed Refugee Claimants Removal Target by 29 per cent in 2014–15: Performance Report”. Canadian Council for Refugees, “Year in Review 2011”, January 2012, 1, http://ccrweb.ca/en/year-review-2011. Y.Z. v. Canada (Citizenship and Immigration) 2015 FC 892. Immigration, Refugees and Citizenship Canada, “Backgrounder — Summary of Changes to Canada’s Asylum System”. Immigration, Refugees and Citizenship Canada, “Pre-removal Risk assessment — Refugee Claims in Canada”, updated June 2016, http://www.cic.gc.ca/english/refugees/inside/prra.asp. Canadian Association of Refugee Lawyers, “Reform Proposals for Canada’s Inland Refugee Determination System and Other Aspects of the Immigration System”, 23–24. Canadian Association of Refugee Lawyers, “Call for Moratorium on Deportations to Burundi”, 21 September 2015, http://www.carl-acaadr.ca/articles/116. Immigration, Refugees and Citizenship Canada, “Notice — Changes to the Pre-Removal Risk Assessment for Burundi”, 12 August 2015, http://www.cic.gc.ca/english/department/media/notices/2015-08-12.asp. Canadian Association of Refugee Lawyers, “Call for Moratorium on Deportations to Burundi”. Nicholas Keung, “Ottawa Urged to End Deportations to Burundi Amid Soaring Violence”, The Star, 4 November 2016, https://www.thestar.com/news/immigration/2015/11/04/ottawa-urged-to-end-deportations-to-burundi-amid-soaring-violence.html. Canadian Council for Refugees, “Suspension of Removals to Burundi: Frequently Asked Questions”, December 2015, http://ccrweb.ca/en/suspension-removals-burundi-FAQ. Hanna Gros and Paloma van Groll, and Renu Mandhane (ed), “We Have No Rights”: Arbitrary Imprisonment and Cruel Treatment of Migrants with Mental Health Issues in Canada (Toronto, Ontario: International Human Rights Program, University of Toronto Faculty of Law, 2015), 48, http://ihrp.law.utoronto.ca/We_Have_No_Rights. Global Detention Project, “Immigration Detention in Canada — Canada Detention Profile”, March 2012, 12, https://www.globaldetentionproject.org/category/publications/country-detention-reports. Immigration and Refugee Board of Canada, “Detention Review Process”, updated 14 August 2015, http://www.irb-cisr.gc.ca/eng/boacom/references/procedures/pages/processrevmot.aspx. Global Detention Project, “Immigration Detention in Canada — Canada Detention Profile”, 3. Gros and van Groll, and Mandhane, “We Have No Rights”: Arbitrary Imprisonment and Cruel Treatment of Migrants with Mental Health Issues in Canada, 70. UK Home Office, “National Statistics Detention”, https://www.gov.uk/government/publications/immigration-statistics-october-to-december-2015/detention. Canada Border Services Agency, “Arrest, Detention and Removals: Detention Statistics”, http://www.cbsa-asfc.gc.ca/security-securite/detent-stat-eng.html. Department of Immigration and Border Protection, “Immigration Detention and Community Statistics Summary”, December 2015, https://www.border.gov.au/ReportsandPublications/Documents/statistics/immigration-detention-statistics-30-dec-2015.pdf.